Sponsored by Uruguay XXI, Loog Guitars, the three string guitars for children created by Uruguayan Rafael Atijas, participated at the New York Toy Fair 2013 and at the Annual Musical Instruments Fair (NAMM Show) in California, United States. It was the first time that a Uruguayan company participated in NAMM with its own stand, a fair where the greatest musical companies in the world like Fender, Gibson and Yamaha showcase their products. In addition to the business opportunities generated, Loog Guitars received important recognition from music masters in the United States and was awarded best musical tool for elementary students. 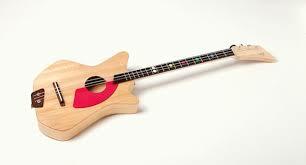 Loog Guitar was invented by Rafael Atijas with the support of a group of industrial designers including Lucía Guidali, Agustín Menini and Carlo Nicola. The project obtained an innovator fund, expanded through a popular kickstarter platform and today produces 2,000 guitars a year for the entire world.